Injection molding is the most commonly used manufacturing process for the fabrication of plastic parts.It is a fast process and is used to produce large numbers of identical items from high precision engineering components to disposable consumer goods which vary greatly in their size, complexity, and application. 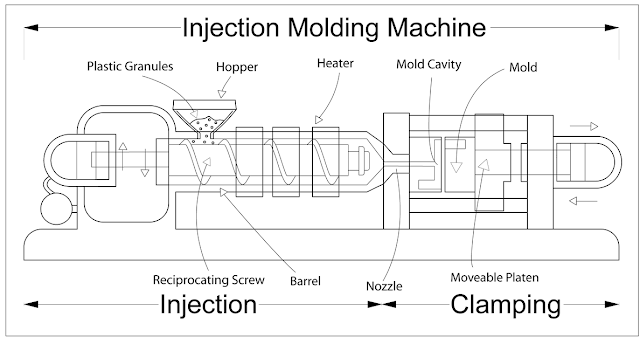 The injection molding process requires the use of an injection molding machine, raw plastic material, and a mold. The plastic is melted in the injection molding machine and then injected into the mold, where it cools and solidifies into the final part. The steps in this process are described in greater detail in the next section. Injection mouldings count for a significant proportion of all plastics products from micro parts to large components such as car bumpers and wheelie bins. Virtually all sectors of manufacturing use injection moulded parts.One of the most common being plastic housings. Plastic housing is a thin-walled enclosure, often requiring many ribs and bosses on the interior. These housings are used in a variety of products including household appliances, consumer electronics, power tools, and as automotive dashboards. Other common thin-walled products include different types of open containers, such as buckets. 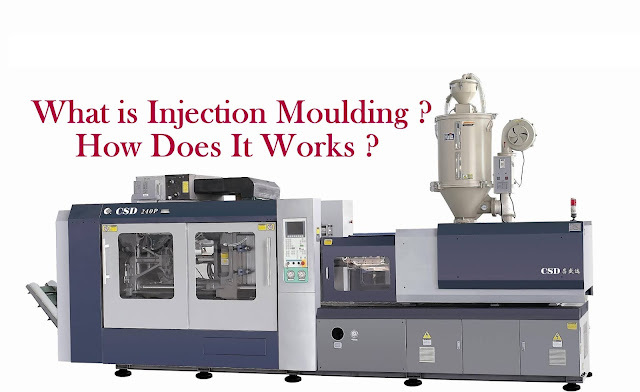 Injection molding is also used to produce several medical devices, including valves and syringes, are manufactured using injection molding as well. The flexibility in size and shape possible through use of this process has consistently extended the boundaries of design in plastics and enabled significant replacement of traditional materials thanks to light weight and design freedom. Prior to the injection of the material into the mold, the two halves of the mold must first be securely closed by the clamping unit. Each half of the mold is attached to the injection molding machine and one half is allowed to slide. The hydraulically powered clamping unit pushes the mold halves together and exerts sufficient force to keep the mold securely closed while the material is injected. The time required to close and clamp the mold is dependent upon the machine - larger machines (those with greater clamping forces) will require more time. This time can be estimated from the dry cycle time of the machine. The raw plastic material, usually in the form of pellets, is fed into the injection molding machine, and advanced towards the mold by the injection unit. During this process, the material is melted by heat and pressure. The molten plastic is then injected into the mold very quickly and the buildup of pressure packs and holds the material. The amount of material that is injected is referred to as the shot. The injection time is difficult to calculate accurately due to the complex and changing flow of the molten plastic into the mold. However, the injection time can be estimated by the shot volume, injection pressure, and injection power. The molten plastic that is inside the mold begins to cool as soon as it makes contact with the interior mold surfaces. As the plastic cools, it will solidify into the shape of the desired part. However, during cooling some shrinkage of the part may occur. The packing of material in the injection stage allows additional material to flow into the mold and reduce the amount of visible shrinkage. The mold can not be opened until the required cooling time has elapsed. The cooling time can be estimated from several thermodynamic properties of the plastic and the maximum wall thickness of the part. After sufficient time has passed, the cooled part may be ejected from the mold by the ejection system, which is attached to the rear half of the mold. When the mold is opened, a mechanism is used to push the part out of the mold. Force must be applied to eject the part because during cooling the part shrinks and adheres to the mold. In order to facilitate the ejection of the part, a mold release agent can be sprayed onto the surfaces of the mold cavity prior to injection of the material. The time that is required to open the mold and eject the part can be estimated from the dry cycle time of the machine and should include time for the part to fall free of the mold. Once the part is ejected, the mold can be clamped shut for the next shot to be injected. 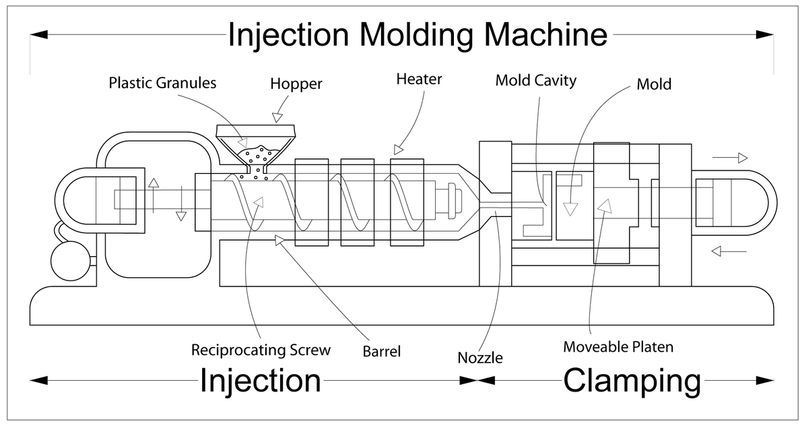 The plastic is then injection through a nozzle into a mould cavity where it cools and hardens to the configuration of the cavity. The mould tool is mounted on a moveable platen when the part has solidified, the platen opens and the part is ejected out using ejector pins. Preparing a product for injection molded manufacturing requires a large initial investment. Make sure you understand this crucial point up front. You want to design the part from day one with injection molding in mind. Simplifying geometry and minimizing the number of parts early on will pay dividends down the road. Make sure to design the mold tool to prevent defects during production. Consider gate locations and run simulations using moldflow software like Solidworks Plastics. Minimize cycle time in as much as it is possible. Using machines with hot runner technology will help as will well-thought-out tooling. Small changes can make a big difference and cutting a few seconds from your cycle time can translate into big savings when you’re producing millions of parts. Design your part to minimize assembly. Much of the reason injection molding is done in southeast Asia is the cost of assembling simple parts during an injection molding run. To the extent that you can design assembly out of the process you will save significant money on the cost of labor. Very Low Waste is occur during the process.